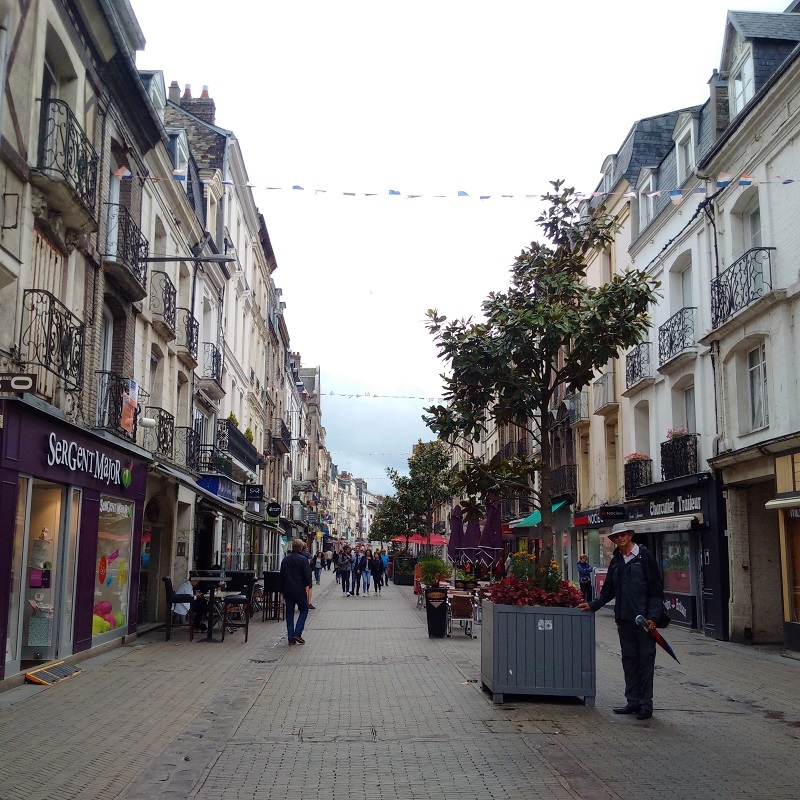 This was a cruise from Dieppe to Boulogne in difficult but safe circumstances during the only window i could find during in the windy weather but it led to a safe arrival and a change of scenery and so was successful from those points of view. More than that, there was not going to be any improvement in the forecast for several days at least and we had spent enough time in Dieppe, with its exposed moorings tossing us around all of the time. I was up reasonably early this morning and then first checked on the weather forecast and established that the gap in the winds was still expected as there would just be 9-11 knots with gusts up to 15 knots and, if anything, the predictions were slightly better than the previous night. There were still 0.5m seas predicted and that was within the F3 designation, and the UK inshore forecast for the North Foreland to Selsey Bill area was ‘smooth to slight’ and so I felt it was right to go ahead with our cruise across the long bay to Boulogne. I went about the business of preparing Lady Martina for her trip after a week’s inactivity and then walked to the office to pay our extra night’s fee; additional to the week that we had already paid, as Kathleen walked to the shops to get some supplies. I was confident of the weather to the point that I planned to leave earlier than the 12.30pm departure time (that was optimum for 10 knots) and I would now be cruising more like 8 knots for economy. All went to plan as we ate, finished our preparations and then slipped our moorings. I kept Lady Martina in the inner harbour before setting off to allow Kathleen to have plenty of time to ship and stow the ropes and fenders and then I set off after taking the precaution of making sure everything was fully secured inside and out. That turned out to be a wise precaution as the state of the sea off the harbour was a portent of things to come. With the strong Spring Flood Tide following us, we were against the NNEly breeze which was only a couple of knots more than the 10knots forecast but, together with the ‘left-over’ waves from the recent windy conditions, were more than the 0.5m predicted sea state and on our bow, making us slam up and down. At least the waves were not on our beam and so we were no rolling but successions of waves would make us pitch until they passed and that was making Kathleen feel uncomfortable. She was managing until she needed to go below for her regular visits to the ‘head’ and then she ceased to enjoy it and, after struggling, made up a bunk in the bridge and went to sleep; leaving me to navigate the boat! Unknown to her, it was not long before the breeze started to back to a more NWly direction and that corresponded with our approaching the north of the bay we were navigating. This meant that the breeze on our Port bow and then beam and was was across the tide rather than against it. 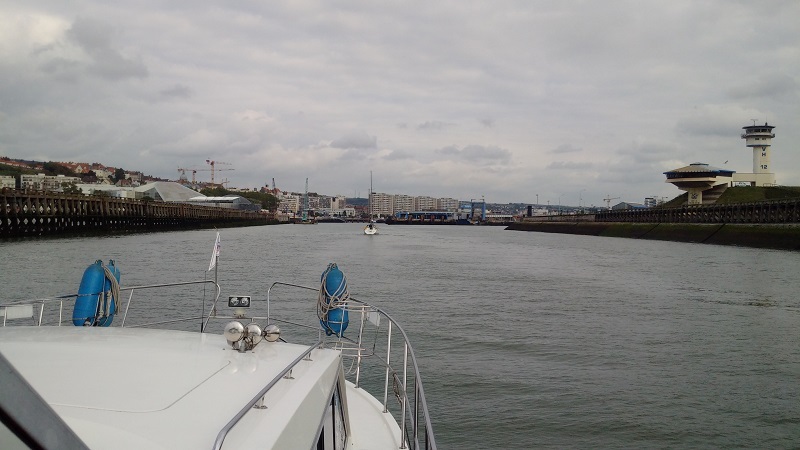 The sea calmed down from Mod to Slight and even became Smooth later as the breeze dropped to only 6 knots when we approached Boulogne. 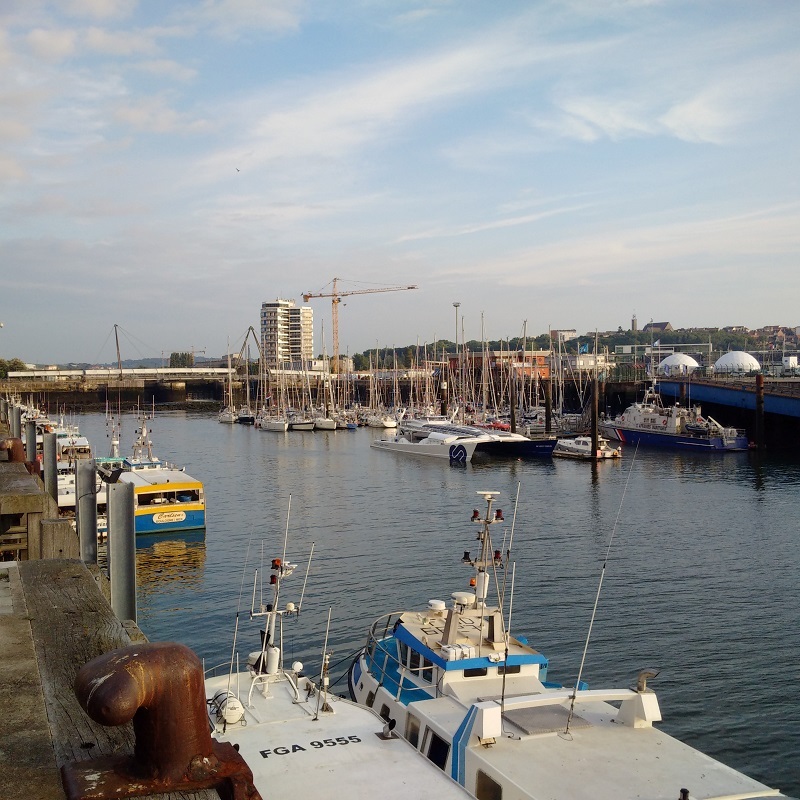 We finally overhauled all of the sailing vessels who had left Dieppe 3-4 hours earlier than us as we cruised across the Boulogne inner bay and got our clearance from Port Control on VHF Ch 12 and then our berthing instructions on VHF Ch 09 from the harbour assistant. She waved us into the alongside berth on the quay-side pontoon and we were happy, comfortable and safe there. We were very low on fresh water but first we used the hose and soapy-sponges to wash and dry off Lady Martina before using the very high pressure to then fill her tanks. After visiting the office and paying for just a single night to start with, we cleared the bridge and then took a walk around the harbour. I still remember the ‘Fast Cat’ service that plied between Boulogne and Ramsgate when I first visited and the considerable infrastructure is still there and one wonders why the two Cities do not join together with some EU money to start a new fast service that takes advantage of their strategic position and assets. There was a touching informal pictorial memorial with bunches of flowers to a tented-black lady who had obviously passed away in the port and I suspect she was sleeping rough before perishing and we were left wondering how and when.